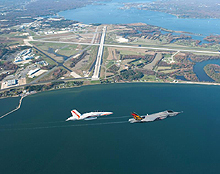 Located at the mouth of the Patuxent River, Naval Air Station Patuxent River occupies approximately 14,500 acres, including its Webster Field Annex, Solomons Recreation Center and the Bloodsworth Island Range. It is one of the most beautiful and vital shore installations in existence today. NAS Patuxent River is where the future of Naval Aviation begins. As the host of more than 50 tenant activities, including the Naval Air Systems Command and the Naval Air Warfare Center Aircraft Division.